Save even more with our VZ Hang® bulk packages, available exclusively in the Larco Products online store. If you have questions about our products, an order you have placed or need assistance placing a new order, please call (231) 629-2071 or message us here. For your convenience, Larco Products accepts checks and major credit cards through PayPal. A PayPal account is NOT REQUIRED. Larco Products ships via USPS. Free shipping applies to U.S. orders only. U.S. orders | 1st Class Packaging (2-5 days) with electronic tracking. International | Larco Products does not ship internationally. For Canada orders, please visit our Amazon.ca store. VZ Hang® Vinyl Siding Hooks are designed so that any person could hang light weight décor on their vinyl siding to enhance the look of their homes without any tools or holes. This was achieved by a simple hook design that wedges in the seam of your vinyl siding and can be installed quick and easily. Its unique style allows you to remove and relocate it many times over with no holes to cover an no damage to your vinyl siding. The integrity of your siding stays in tact with may hanging opportunities at your fingertips. Patent #7,823,853. Made in the USA. VZ Hang Vinyl Siding Hooks are designed so that any person could hang light weight décor on their vinyl siding to enhance the look of their homes without any tools or holes. This was achieved by a simple hook design that wedges in the seam of your vinyl siding and can be installed quick and easily. Its unique style allows you to remove and relocate it many times over with no holes to cover an no damage to your vinyl siding. The integrity of your siding stays in tact with may hanging opportunities at your fingertips. EXCLUSIVELY AVAILABLE ON THIS SITE! 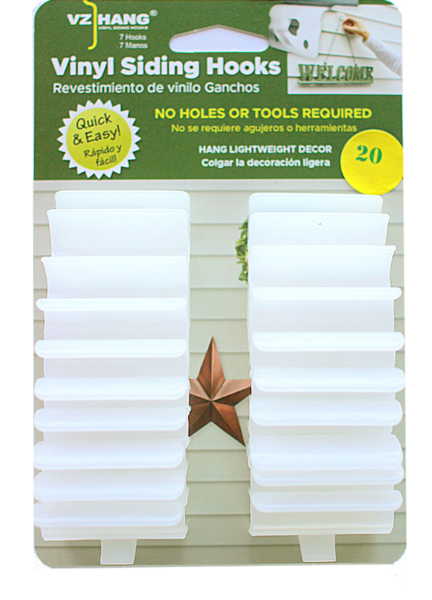 Get 20 of our original VZ Hang® Vinyl Siding Hooks in this bulk package only available on larcoproducts.com. VZ Hang® is designed to easily hang outdoor decor on vinyl siding without any tools or holes! 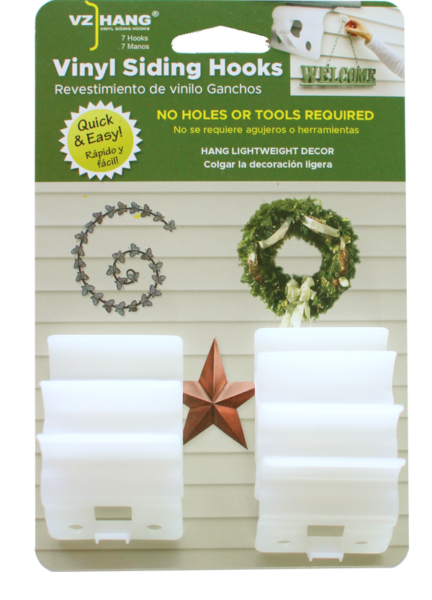 Get 20 of our original VZ Hang® Vinyl Siding Hooks in this bulk package only available on larcoproducts.com VZ Hang is designed to easily hang outdoor decor on vinyl siding without any tools or holes! 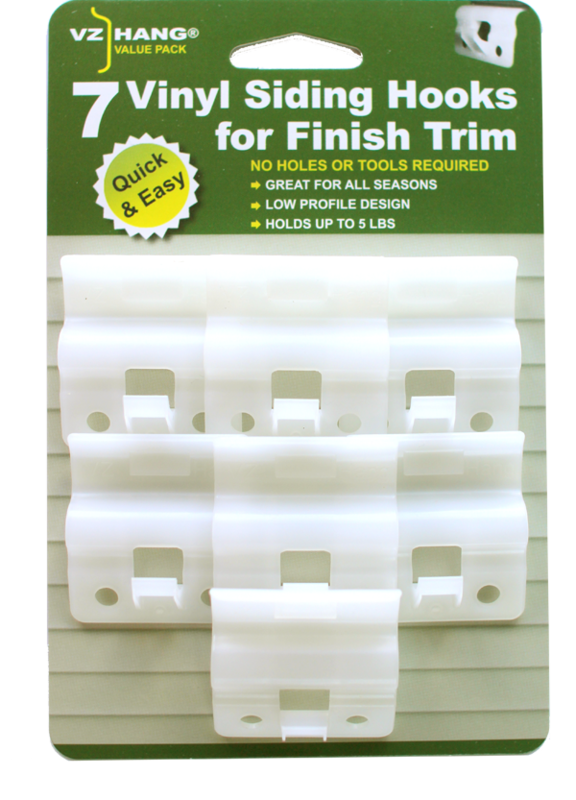 VZ Hang® Finish Trim Hooks are specially designed to hang outdoor decor on finish trim. VZ Hang® Finish Trim Hooks can be used for hanging all your lights, banners etc. from your finish trim to enhance the look of your home without any tools or holes. Its unique style allows you to remove and relocate it many times over with no holes and no damage to your finish trim. 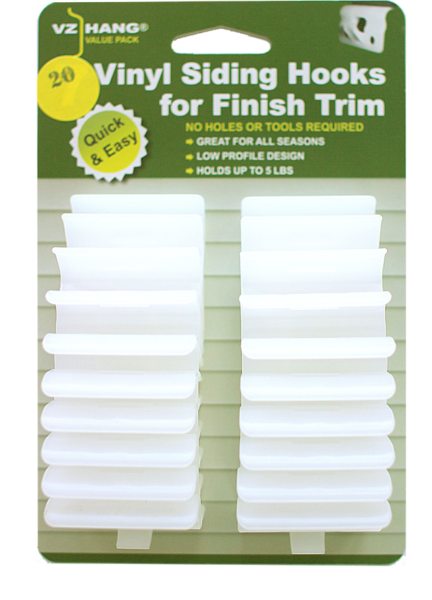 Get 20 of our VZ Hang® Finish Trim Hooks in this bulk package only available on larcoproducts.com. VZ Hang® is designed to easily hang outdoor decor from their vinyl siding finish trim without any tools or holes! 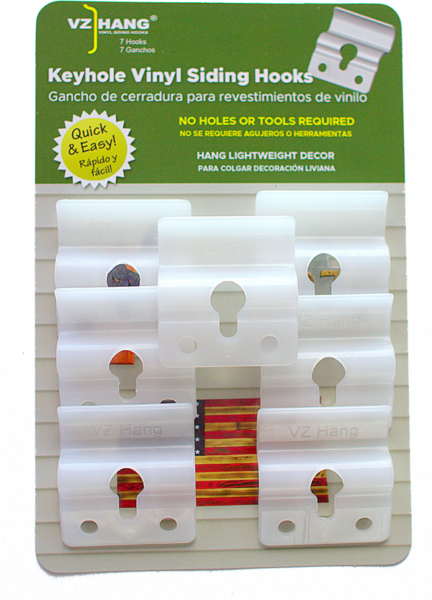 New VZ Hang® Finish Trim Hooks are designed to hang lights and banners from your Finish Trim. Twenty clips in a package for only $19.95! FREE Shipping within the USA! VZ Hang® Keyhole Hooks are the newest addition to the VZ Hang® Line. VZ Hang® Keyhole Hooks were made to hang that one of a kind light weight decoration made from wood by attaching a nail or screw to the back of your decor and hanging them with the keyhole Hook i.e. welcome signs, house number signs, etc. Just like our original hook you simply wedge the keyhole hook in the seam of your vinyl siding allowing you to remove and relocate it many times over with no holes and no damage to your vinyl siding.